Henry, Nancy, Michael and (snow dog) Madison wish you a Merry Christmas and a Happy New Year! 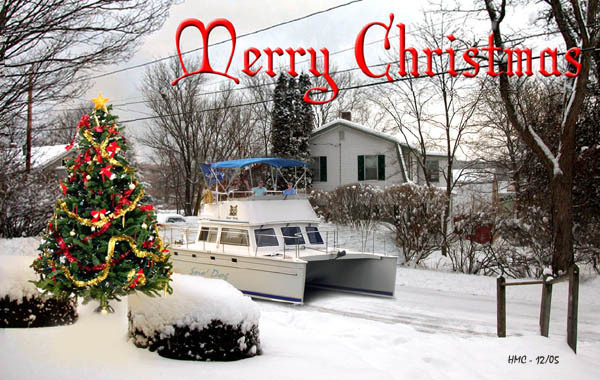 The house you see behind our virtual boat (we didn't own Sno' Dog in Dec 2005) is our REAL house at 22 School Street in Hanover, New Hampshire. I must admit, in the interest of full disclosure, that the Christmas Tree is fake. It was added by Salwa Farah of PDQ. New for 2006: See our 2006 Christmas Card!